For people that don’t know what Kickstarter is (all five of you), Kickstarter is a crowd-funding platform in which anyone who has an idea is able to use to raise funds to make that idea or project happen. Creators will pitch their idea on Kickstarter and set a deadline and minimal funding goal. Users will then decide whether or not they want to back the project. Most Kickstarter projects have a multi-tier reward funding system, where the more money you pledge to the project, the greater the rewards. For example, by pledging $20 you would get the product when it’s ready and complete. But if you decide to pledge $40 dollars, you would get a limited edition of the said product or more goodies might get thrown in. However if the project doesn’t meet it’s funding goal within the set deadline, the project would not get funded and all money pledged thus far would not be charged to the user. Projects only get funded and users only get charged when the project hits it’s minimal funding goal before the deadline. The game development studio approach a publisher and pitches the concept and idea of the game they are trying to develop to them and hopefully get the development resources needed. In return, publishers will then publish their game and get the fair share of the sales profit. Publishers approach the game development studio to get them to develop a game and will fund their development costs. The publishers will still take a fair share of the profit if not most of it. Or publishers will get their own developments teams within the company to create the game. The terms agreed between publishers and game development studios tend to favour the publishers more. Publishers get most of the profit from game sales and also more often than so get to retain the rights to the game even though the development studios created it. What Kickstarter does for game developers is remove the publisher altogether. With Kickstarter, game developers are able to self-publish, retain the rights to the game and more importantly have the creative freedom to develop the game they had originally envisioned. 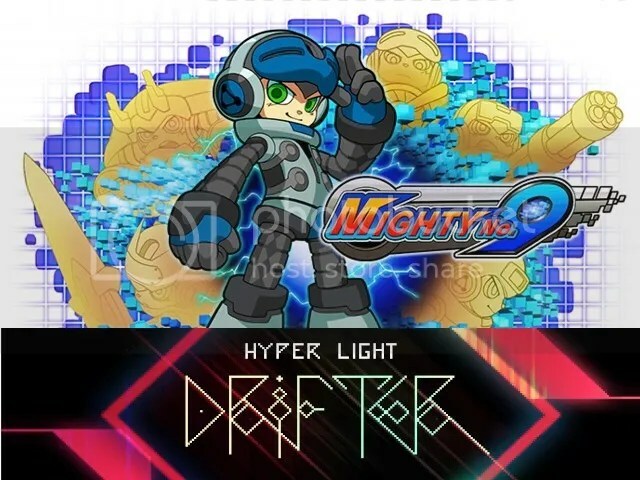 Mighty No.9 and Hyper Light Drifter. The two most recent Kickstarter darlings. But as mentioned at the beginning of the post, is it all rosy once the game has been successfully funded? Will the games turn out as mentioned in the concept video or demo? What if it doesn’t? Game developers having more creative freedom could turn out to be a double-edged sword. It’s great on one hand when developers are able to create the game they had initially envisioned but what’s keeping them on track? With all the freedom in the world, developers may end up spending more time trying to create their perfect game. This would result in the game getting delayed which would in turn use up more funds. Successfully funded Kickstarter game such as Clang and double failure but self-funded Shadow of the Eternals are such examples of games not being managed properly. What happens to the backers of those projects then? This is where Kickstarter becomes a risk for the backers. There is no guarantee that the project creators will be able to fulfil their promise to deliver the product as intended and Kickstarter can do nothing about it once the project has been successfully funded. This is because Kickstarter is merely a platform/tool that project creators use for crowd-funding. Once a project has been funded, the platform has already served it’s purpose and after that it’s between the backers and the creators; Kickstarter will not and can’t intervene. That being said, project creators are still liable to damage charges should backers choose to pursue such charges. So while Kickstarter is definitely a great way to secure funding for game developers, it is not without it’s flaws. Game developers who decide to use Kickstarter to fund their games will have to be more disciplined and better managed. The onus is on them to deliver what they have promised without any external pressure. With all that said and done, is Kickstarter here to stay as a platform for games to be funded? Judging from recent successes, almost certainly. PS: Here are some Kickstarter games you should check out. The spiritual successor to Mega Man,Mighty No.9 has already been successfully funded with over 4 million dollars but you can still back the project through paypal although you won’t be able to get any of the physical rewards. Hyper Light Drifter has also reached it’s funding goal but there’s still 7 days left before funding closes so get in there and back this hauntingly beautiful game. And here is Project Phoenix whose goal is a lofty one, trying to rediscover that JRPG magic to put it back on the map again. There’s some really big names (NOBUO UEMATSUUUUUUU) attached to this game. Funding has also ended but you can still back this game through paypal.